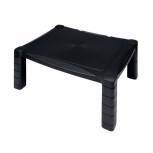 Fellowes Standard Monitor Riser Graphite 9169301 Pack of 1 Fellowes Standard Monitor Riser made from sturdy high impact plastic supports up to 40lb or 15ins monitors. 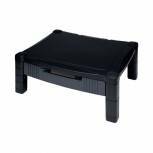 Adjustable to three different heights 2-4ins fitted with non-skid foot rings to ensure stability on any surface. W333xH51-102x343mm. 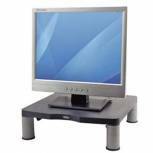 Fellowes Smart Suites Monitor Riser Black /Clear 8020101 Pack of 1 Fellowes Smart Suites monitor riser raises your monitor to eye level to help prevent neck strain. 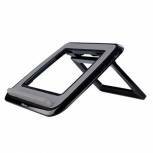 Supports up to a 21 inch flat panel monitor or a maximum weight of 10 kg. Three height adjustments. 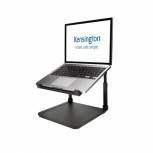 Kensington Grey SmartFit Easy Riser Laptop Cooling Stand 60112 Pack of 1 Easel type notebook riser is comfortable to use and reduces any exposure to RSI risk. Angle settings from 3 degrees up to 40 degrees for true LCD monitor height. Folds flat for portability. Design improves viewing and typing angle. 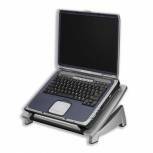 Fellowes Office Suites Laptop Riser 8032006 Pack of 1 Laptop riser places your laptop at a comfortable viewing angle for ease of use. Supporting front edge prevents laptop from sliding off. Adjustable tilt allows you to customise your viewing angle. Stacks on letter trays for convenience. 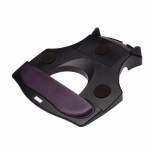 Fellowes Standard Monitor Riser 91712 Pack of 1 Fellowes Standard Monitor Riser made from sturdy high impact plastic supports up to 40lb or 15ins monitors. 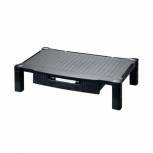 Adjustable to three different heights 2-4ins fitted with non-skid foot rings to ensure stability on any surface. W333xH51-102x343mm. 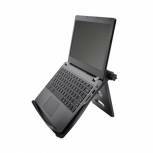 Fellowes LCD/TFT Monitor Riser 9145003 Pack of 1 TFT monitor riser with unique height adjustability from 7.5cm to 11cm. Platform rotates 45 degrees to assist shared viewing. Supports up to 14kg. 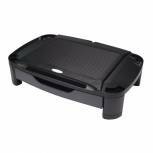 Includes storage tray for paper supplies. 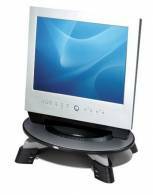 Modern design complements flat panel TFT/LCD monitor styles. 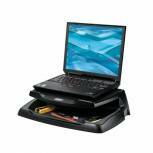 Q-Connect Laptop and LCD Monitor Stand KF04553 Pack of 1 Monitor stand with non-skid foam padded platform. Elevated platform surface size: W370 x D235mm. Holds up to 5kg. W465 x D345 x H120mm. Durable scratch resistant construction. Black. 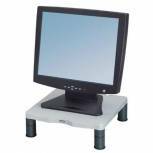 Fellowes Basics Monitor Riser Graphite 91456 Pack of 1 Fellowes basic TFT/LCD monitor riser. 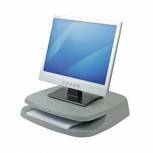 Supports monitors up to 36kg or 21 inch TFT/LCD monitors. Adjusts from 75 - 110mm in height. Lower shelf provides storage for paper and sundries. 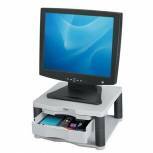 Efficiently organises monitor and power cables. 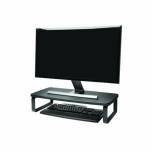 Fellowes Desktop Monitor Base 9171302 Pack of 1 Height adjustable monitor base, includes cable and power cord guides. 2 storage drawer for media storage, pens, A4 paper etc. At maximum height the drawer pulls out over the keyboard. May also be used on top of desktop CPUs. 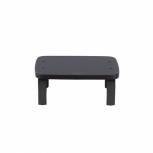 Fellowes Designer Suites Laptop Riser 8038401 Pack of 1 Fellowes Designer Suites Laptop Riser. Height adjustable. Angle adjustable between 0-30 degrees for increased personal comfort. 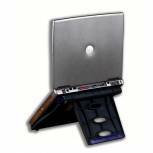 Stabilising front edge prevents laptop from sliding off the unit. 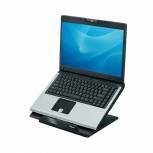 Cooling vents help dissipate laptop heat.